Adds 0, 0, 0, 0, 10, or 10 to the team's roll. The Brawny Dice Block is Donkey Kong's special, brown Dice Block from Mario Party: Star Rush. 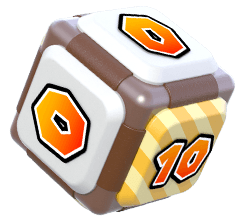 In Toad Scramble, when players have Donkey Kong in the party, he can roll from a range of four 0's and two 10's to add to the player's total roll. The Brawny Dice Block rolls are in extremes: it has a high chance of not helping players at all and a smaller chance of greatly boosting their roll. This page was last edited on February 26, 2019, at 23:08.